Just as you’ve mastered the basics of online marketing and how to use the internet to reach online consumers, mobile marketing comes into play, as another form of online marketing that has emerged as such due to the development of modern technology. Mobile devices have completely changed the way we interact online, so companies are now focusing their efforts on this new media, which is changing the way we think about online marketing. Before we explain the influence of mobile marketing, let’s examine how our lives with mobile devices look like today. It’s evident that mobile devices are slowly taking over. As they become an inseparable part of people’s lives, they also become the best way to reach people. Mobile devices have long surpassed their main usage, to make phone calls and send messages. They are now used for online interaction, obtaining information, reading emails, placing orders, shopping, etc. The statistics above support the fact, that we have come to see our mobile phones as something we can’t live without, which puts media such as newspapers and television to second place. Having this in mind, it’s safe to say that mobile marketing has become a very important aspect of the business to customer relationship, and consequently, the influence of mobile marketing on business success is substantial. Everything you know about online marketing and how to optimize your website in order to boost its performance needs to be reevaluated from the perspective of mobile users. Although online marketing helps with website positioning, mobile presence is a completely new world where different rules apply. Therefore, if you want to get the most out of mobile marketing, you need to start focusing on mobile user experience. Nearly half of the website visitors will leave the mobile website unless it loads within 3 seconds. That short interval is what you have to either convert the visitors or lose them forever. People are also more likely to leave the websites that aren’t mobile-friendly. Even if you manage to convert visitors and get them to buy from you, researches have shown that those customers are unlikely to come back due to the poor website performance. Online users expect an instantaneous response, and unless they’re getting that from your website, they are most likely to find another website that will provide such response. Besides lost clients, having slow-loading websites also increases bounce rates, lowers conversion rate, etc. All of this has a negative influence on your website performance and thus leads to less successful business. Optimizing the websites for speed and responsiveness is today more important than ever. The starting point is analyzing your website and exploring ways to improve potential features that might be harming its performance. 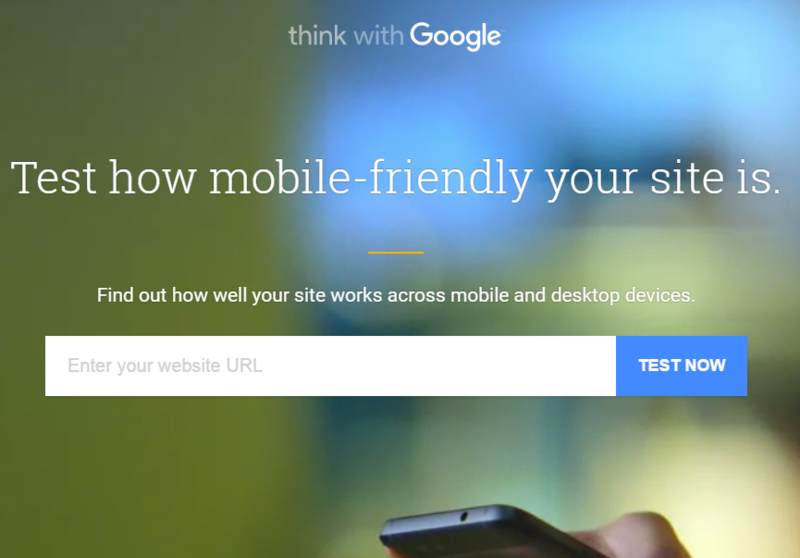 Use this tool to analyze how mobile-friendly your website really is and what you can do about it: https://testmysite.thinkwithgoogle.com/. 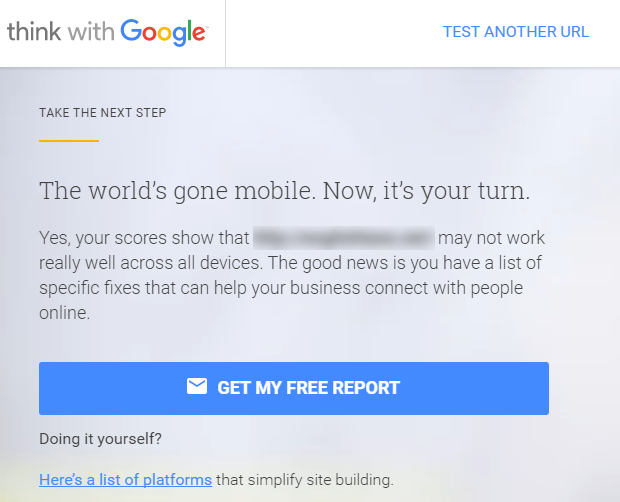 Once you test your website, you’ll get a report on how to fix the potential issues and improve website’s performance on mobile devices. As you can see, Google is providing this tool as a way to help developers and business owners understand the importance of making their websites mobile-friendly and optimizing them to fit well with new search engine algorithms, that are starting to push forward mobile-friendly design. Google defines micro-moments as “the moments when we turn to a device—often a smartphone—to take action on whatever we need or want right now. These I-want-to-know, I-want-to-go, I-want-to-buy, and I-want-to-do moments are loaded with intent, context, and immediacy” (Source). This basically means that when it comes to mobile users, you have that micro-moment, a brief period of time to fulfill their need, a brief period of time to convert visitors into customers and to ultimately satisfy the need the user has. This opportunity is the major characteristic of mobile usage and hence the essence of mobile marketing as a marketing approach aimed towards grabbing the attention of the users in a short instance. As the overall internet usage is shifting towards mobile usage, the importance of these micro-moments is growing each day. 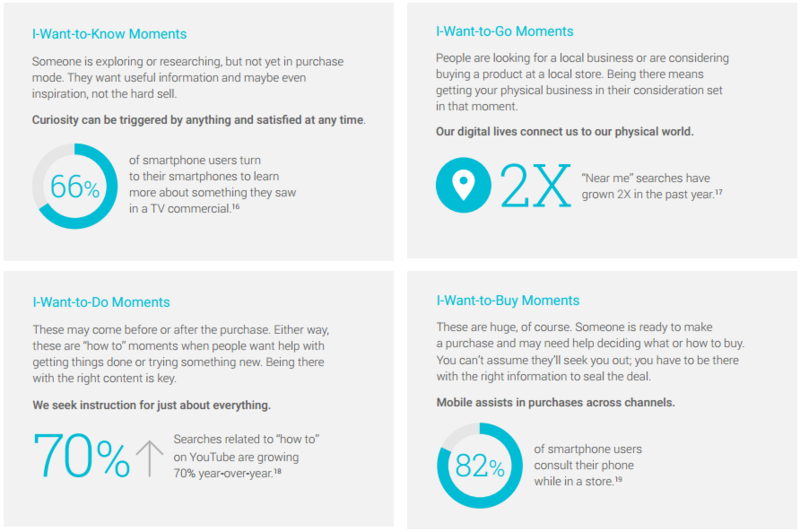 The first step is where you define micro-moments for your business. You need to anticipate what would mobile users look for when they search for your business as this helps you meet this demand, regardless if that is easily accessible phone number, a slideshow of your catalog, etc. Once you know what to expect, you’re able to provide relevant response and meet the demands of the mobile users. The second aspect you need to consider when it comes to micro-moments is the fact that mobile users need information quickly. This means that we go back to mobile optimization as a necessary part of mobile marketing, where swift and seamless user experience becomes a priority. You need to take advantage of the short gap you have to engage the users before they skip to another search result. For more tips on how to explore the power of micro-moments, check out this article: Five ways marketers can win in mobile-first micro-moments. 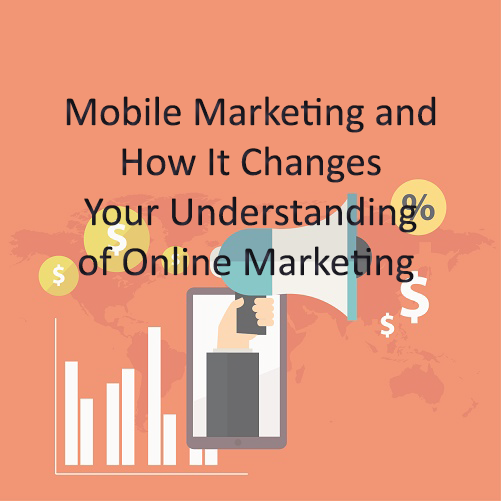 Having in mind the importance of micro-moments and the fact that users reach for their mobile devices to fulfill a certain need, you need to dive into this a little bit deeper, as it ultimately helps you understand how mobile marketing practice may change in comparison to online marketing in general. Each of these moments represents a user’s intent, something the user wants to achieve through the mobile device. Your goal is to recognize this intent in advance. Analyze your business and user behavior to define and predict the moments your target users will experience, as this helps you define your mobile strategy as a whole, which should be aimed at facilitating those moments by providing relevant information. For example, if you have an online store, I-want-to-know moments and I-want-to-buy moments are something you should expect from your target users. In the first case, the user needs to know a little bit about the product, he or she is interested in checking out reviews, features, etc. This kind of intent helps you design your website content in order to meet this intent and help users to slowly transfer from the first moment, where they do the research, to the next phase, I-want-to-buy moment. When it comes to the second moment where the user is interested in buying, you need to have a mobile-friendly webshop where you will provide information about each product. Thinking about user experience, in this case, is very important, as you need to allow easy and safe purchase for the users. As you can see, each intent of the user is something that should be a goal for you, something that you need to incorporate into your mobile marketing strategy, in order to be able to engage the users you reach through mobile devices. While we’ve been focused on user experience and mobile optimization, we shouldn’t neglect the full potential of mobile marketing. As the process of targeting and reaching users through mobile devices, mobile marketing offers the ability to communicate through SMS, chats, video chats, emails, and by developing apps. All of these are methods you can use in the process of mobile marketing to communicate with your customers. Having in mind the massive presence of mobile devices in people’s lives and habits that lead them to reach out to mobile devices when seeking relevant information, exploring the full potential of mobile marketing needs to be among your top priorities. You need to explore different methods that are available on mobile devices in order to define an approach that gives best results. The best way to do so is by testing them. Using forms on your website or having users filling out the forms in your store is a good way to obtain users’ mobile phones, allowing you to use SMS for direct communication and promotion on mobile devices. The same can be applied for email addresses, in which case you need to optimize email campaigns for them to be easily accessible through mobile devices. App development is another area where you can learn a lot about your target audience, which can help with reshaping your strategy and improving customer relationship. The goal of all these methods is to explore the possibilities mobile marketing offers and use it to improve the success of your online business. We’ve witnessed a rapid evolution of mobile devices, ever since the introduction of the first iPhone in 2007, leading to constant changes in mobile marketing, which means that you need to keep up with these changes in order to make sure you’re leveraging this medium in the process of reaching online users. As an example, we have the latest Accelerated Mobile Pages (“AMP”) Project, originated from the expectation that content should load faster than ever. This idea is becoming realized through the project in the form of web pages designed to load almost instantaneously. The ultimate goal is to completely redefine mobile user experience, but for you, this is another trend you need to have in mind and explore ways to incorporate it in your own online presence. We can’t fully predict how the mobile ecosystem is going to change in the future, but what we can safely conclude is that mobile connectivity will most likely gain even more importance in the future, leaving marketers to explore different ways to reach mobile users. Mobile is slowly taking over, so it’s only a matter of time, when it will become the central part of overall internet usage. For marketers, this means, that each of the aspects we’ve highlighted here, is of great importance in order not to stay behind and miss this trend of the whole digital world going mobile. This “mobile trend” is changing the entire world for both consumers and marketers, but what we all need to do is adapt and embrace the trend that is taking over, as this gives us a chance to stay informed, to communicate with more success, and eventually get the most out of the mobile world. Let’s wrap it up with mobile marketing predictions from startup founders that together define mobile marketing trends that will become dominant in the upcoming years: 14 mobile marketing trends that will dominate in 2016.